Warm side of average overall. Trying to have it both ways now huh? Can’t complain about the “cold” and troll about the warmth at the same time. Well, I guess if anyone could pull that off it would be you. It’s on the cool side of normal. Trying to have it both ways now huh? Can’t complain about the cold and troll about the warmth at the same time. It's not a cool run overall. Just describing what it shows. 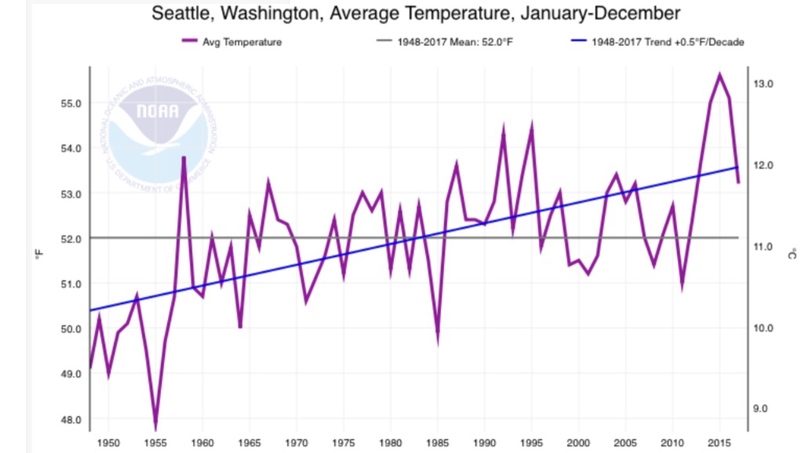 Blah blah blah Puget sound warm bubble UHI. I guess below 90 is now considered coolish down there. Plenty of 80s showing up in the 4-10 period. Mid to upper 80s on some days. Why are we always debating what the models show? The answers are right in front of us..there should be nothing debatable about it. The 12z Euro was, clearly, a cooler than average run. Even if modestly so, the numbers are there for all to see. Whether it’s correct or not is another story. And the surface maps show above the normal temps here overall in the 4-10 day period. It's all right there. No debate. You average 5 days of 850mb temps and call the whole period cold. Go day by day on the surface maps. Wish I could call that coolish. OLM was more above average than PDX. What happened to UHI. 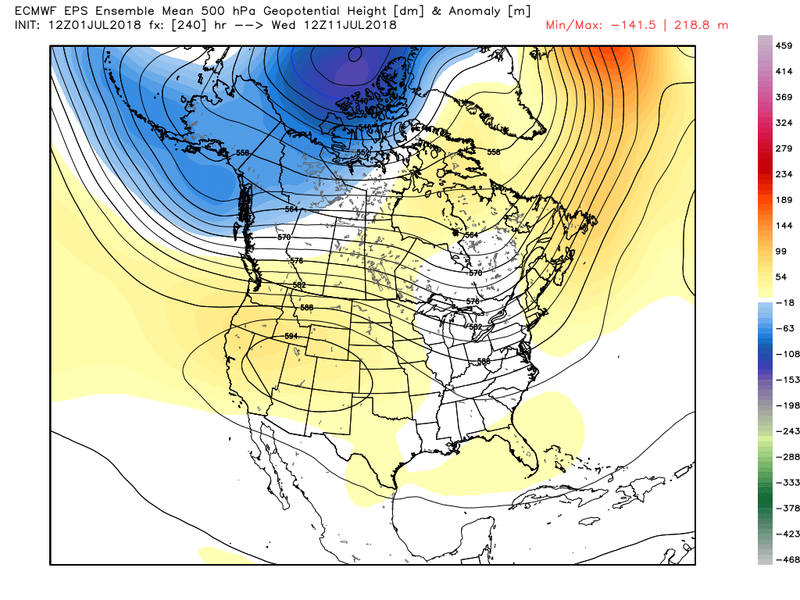 I think there were a few ULL passages that favored that area for colder anomalies. Either that or Jesse is right and PDX just needs a sensor swap. They switched Astoria’s sensor a little while back and it seemed to fix the warm bias there (sensors tend to drift warm with age). And its looks cooler because of the quick moving trough on Saturday morning. That does not mean all 5 days are the same. 4 of those 5 days are warmer than normal at the surface. Phil always equates 850mb temps to our surface temps... despite many mistakes in the past doing that. He applies East Coast rules. I’m surprised at those temps looking at the maps. Figured there might be more marine influence with that area of heat to our east. Just a weak front on Saturday morning that brings some rain up here and clearing by afternoon... otherwise sunny. Sun and warmth lovers just can’t catch a break. Lol, here we go again. It’s not that simple here either. Especially during the cold season, 850s are often a terrible predictor of our surface temperatures. Summer might be only exception where 850mb temps are more predictive of our surface temps, due to the absence of stratiform overcast/rain and the strong sun. But that’s not the case during the rest of the year. I can verify that this warming trend is mirrored by my personal weather station in a rural area well away from any possible UHI influence. IMO it looks more like a gradient pattern preceding a jet extension, as opposed to a “strong ridge”. Maybe it will morph into the ultimate karma-delivering pattern that roasts Jesse while leaving Tim/Farmboy in a deep, drizzly marine layer. FWIW, I’m becoming less bullish on western ridging by the day. The LF WHEM z-cell state is just completely kattywampus compared to the climatology for +PNA/cyclonic breakers, and I don’t think it wants to change much in the near future. Might take until autumn at this rate. So why are the ECMWF and the GFS both showing a western mega ridge extending all the way out to 240 or 384 hours, respectively? I can verify that this warming trend is mirrored by my personal weather station in a rural area well away of any possible UHI influence. Yeah, I don't know what Phil is talking about. There's never been any reason to think EUG is affected by increased UHI like many other stations. That said, a solid ~ 40% of members have a monsterous ridge after D11. The other camp has flat ridging biased south and zonal flow. Very distinct camps. Will be interesting to see how it unfolds. I was looking towards day 12 to 13. I meant in terms of a lower frequency background state. 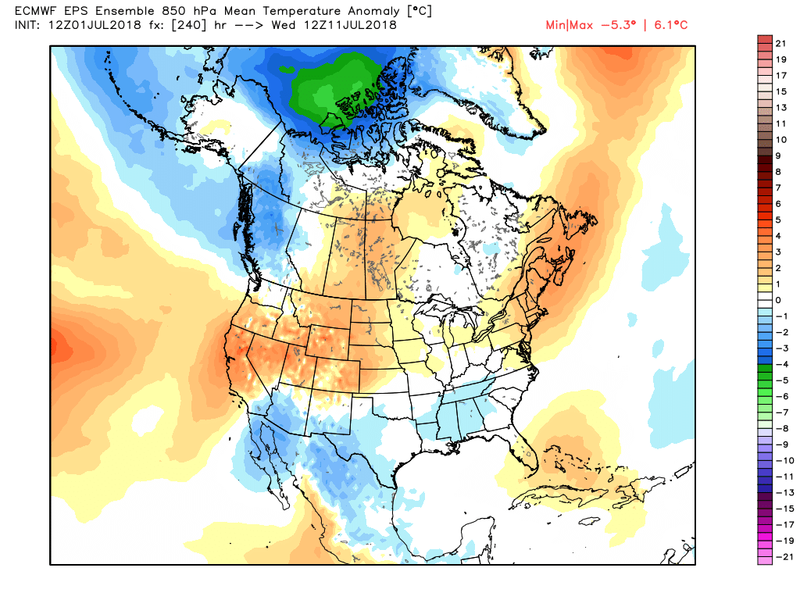 I’ve been predicting a warm period in July for awhile, subseasonal timing issues aside. What type of sensor do you have, and when was the last time you replaced it? I’ll grab the EUG data from NCDC. 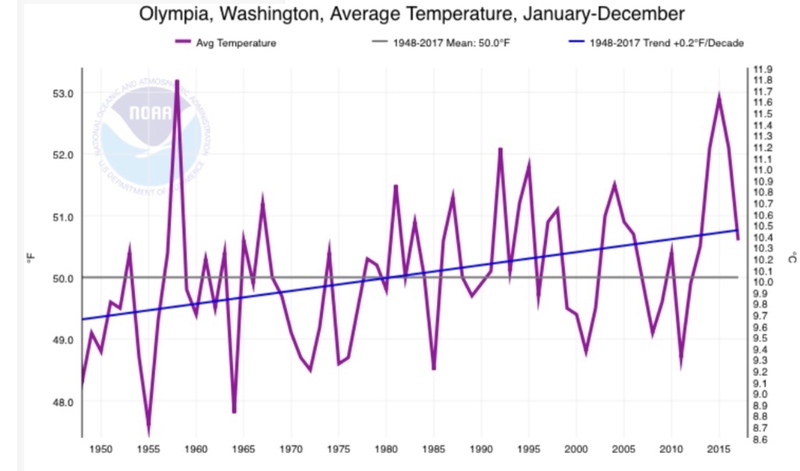 Definitely a faster warming trend there. Yeah, there are some huge ridges in there. But it’s only about half of the ensemble members that really extend it into WA/BC. Looks like I was wrong. 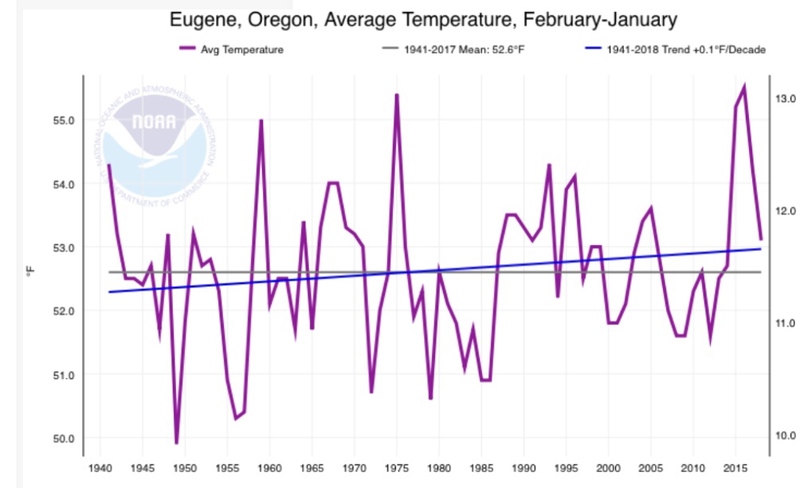 The warming trend @ EUG fits the regional lower tropospheric trend. About 0.1*F/decade. My apologies. 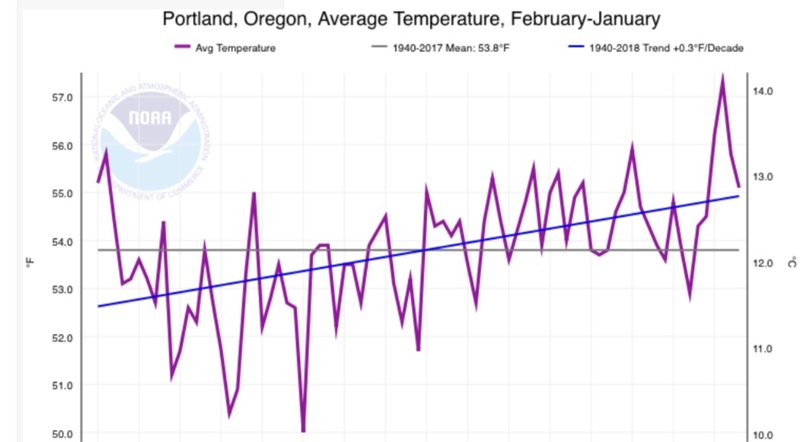 Meanwhile PDX’s trend looks to be tripled by UHI, at 0.3*F/decade. The difference between SEA & OLM is laughable. The trends are rounded, but SEA’s is triple OLM’s. Not sure what airport you're thinking of. Eugene's airport is a few miles outside of town and still largely rural. There has been no significant development whatsoever there recently. And their lows are often the coolest of any I-5 station on calm, clear nights. Unaffected by UHI. How the hell would karma be me getting roasted? Probably a matter of time before the area is developed. But yeah, for now it is one of the least UHI influenced stations on the west side. Yeah, see above. My recollection was not accurate. Its temporary though. 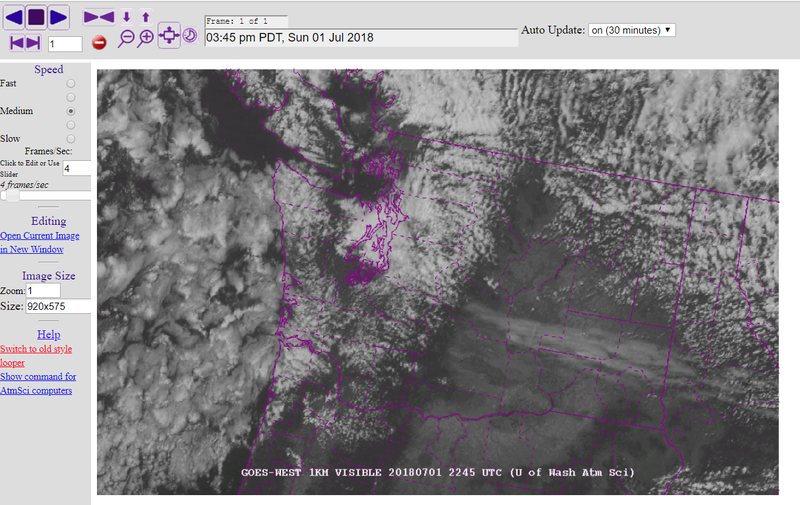 Satellite loop shows a c-zone signature to the low cloud movement around the Sound. That will fill in the clouds again soon enough. Sunny but windy here. Gusting around 30mph. Getting close to 70F, which was pleasant enough down at our local Canada day festival. July is off to a pleasant, partly sunny and pensive start! Just beautiful outside. Very few clouds and 81F. 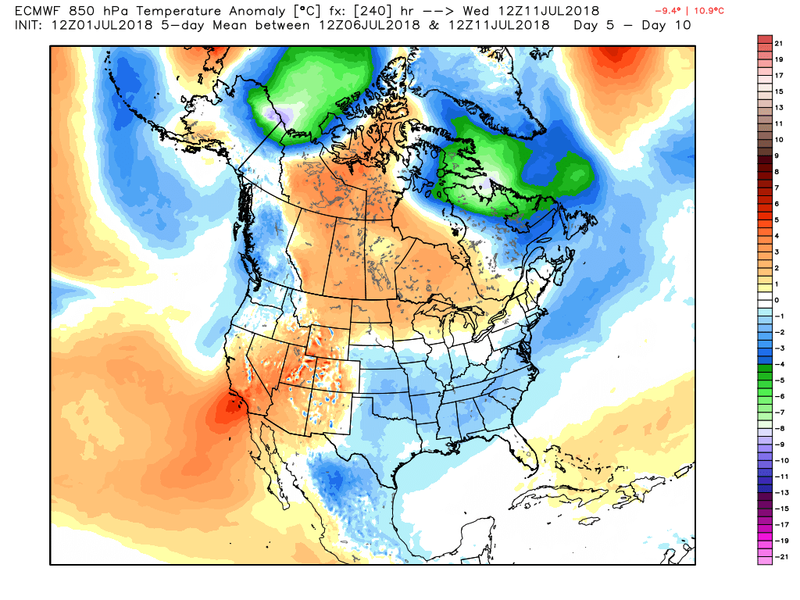 They should have had the "much above normal" area over Colorado rather than over Montana. Pshhh, idiots! We had 14 minutes and 38 seconds of non-stop sunshine! Now the clouds have filled in again in typical c-zone fashion. Of course. But you get a lot more snow than here...positives for you. An 80-free July so far. Let's see how far this can go, guys! How hot is this potentially? Walked down to the Kinsol Trestle this afternoon, one of the largest wooden trestles in the world. Tim will appreciate the clear blue skies above. It might be cold, it might be cloudy, but at least it’s not raining! BBQ time! Let's have a 13-14 repeat with a crazy stormy September followed by the best winter we had since 2008. Yeah, that's what I'm currently thinking at the moment. Except we will even have a better winter than 08-09. Best winter in 50 years since 68-69 coming up IMHO. First hint of sun all weekend comes at 8pm Sunday evening. I'm not quite sure what you're trying to get at, so not going to get into much of a debate on this. All I'm saying is that after an extreme weather event you're going to get a slight relief from those conditions. It's not going to stay hot all summer long, you will see some normal weather in even the hottest summers. 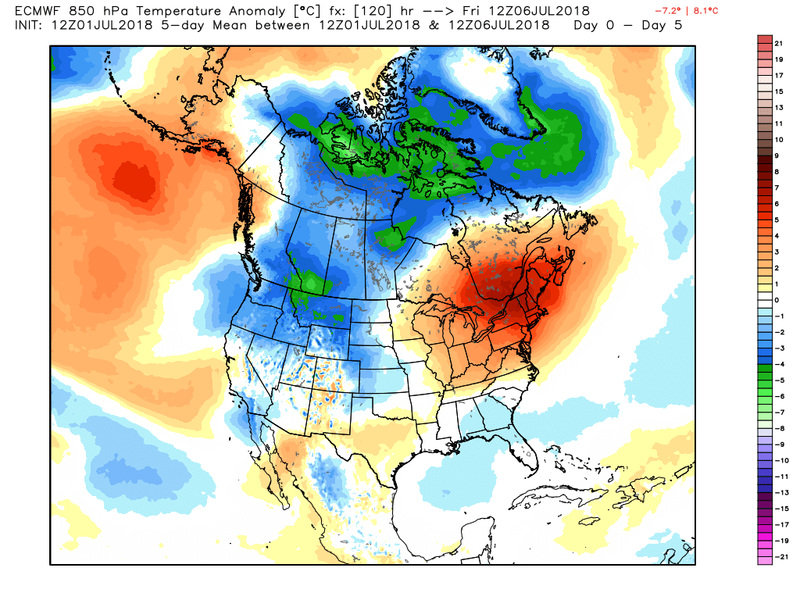 I actually agree with you that the hottest anomalies in the PNW will be in July but I think it will be the last 2 weeks of July. It might extend to the first week of August. August will be warmer than what we just saw this month relative to average though and I completely disagree with you about September. Early start to fall this year as I mentioned before.